Yesterday we stopped at Thomas Reservoir in Erie on our way back from Denver. 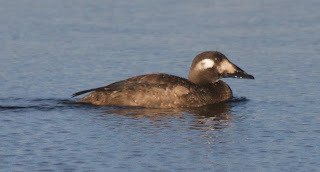 A juvenile White-winged Scoter had been reported there a couple days ago. 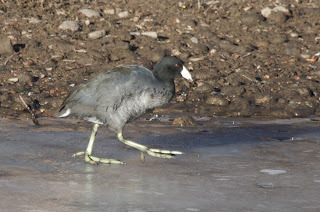 There was a corner of the lake that wasn't frozen over, which harbored some waterfowl and gulls. 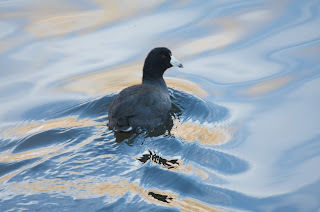 There were Canada Geese, a female Common Goldeneye, a pair of Mallards, lots of Ring-billed Gulls, and the White-winged Scoter! 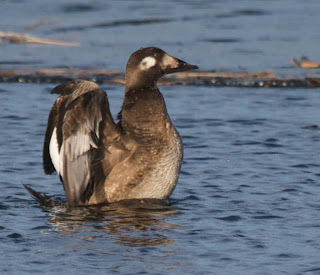 The only White-winged Scoter we’d seen previously was on the Upper Texas Coast last spring and it was a very distant view. 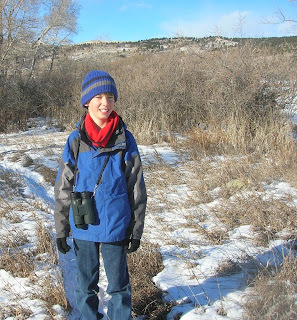 Yesterday, December 24th, our family birded the South Platte River by Chatfield State Park with our cousin Victor and Aunt Diane. 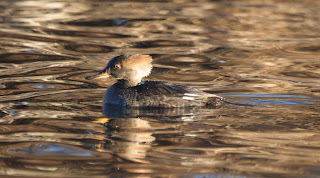 We started birding at 4 o'clock PM, and the light on the water was magical. The river was loaded with waterfowl! 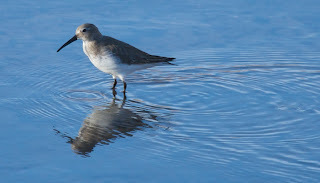 A Dunlin had been reported here a couple of days ago, and Victor and Aunt Diane had seen it the previous day. And, we saw it today! 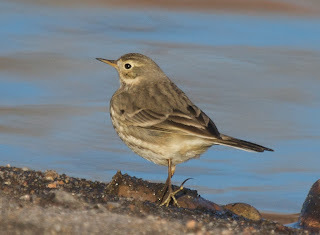 It was with several Killdeer and a couple American Pipits between a foot bridge and C-470 in the river on a sandbar. 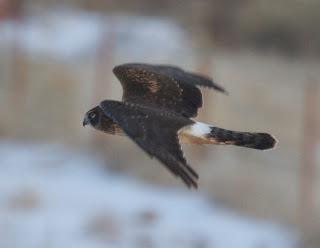 On December 20th, we participated in the Longmont Christmas Bird Count with Maggie Boswell and Deanna Williams. Peter Gent joined us for part of the day. Our area was Hwy 66 on the north, Hwy 36 on the west, Nelson Road on the south, and 75th St. on the east. Most of our area was rural, agricultural lands which included parts of the St. Vrain River and some ponds, most of which were frozen. The weather was freezing, but sunny. It was much more pleasant in the weather department than the Boulder Bird Count! My mom and I (Joel) were in town today and on our way home, we stopped to get our mail on Blue Mountain Road. 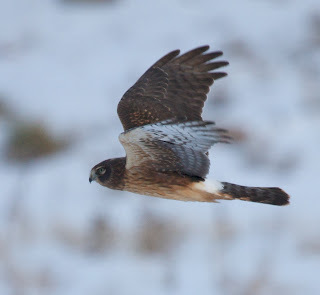 A female Northern Harrier was flying and dropping down every 3 yards, as it was hunting along a roadside ditch going south. It eventually flew across the road and headed north, as it checked the fields to the east. It flew back across the road and perched on a fence post. It had basically made a big circle and we were in the middle of it! It was flying quite close and unconcerned about our presence. 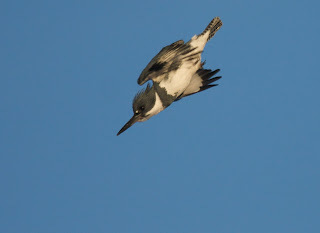 We had a great opportunity to watch it fly and hunt, and I was glad that we had the camera in the car! Today it was really active around our house! 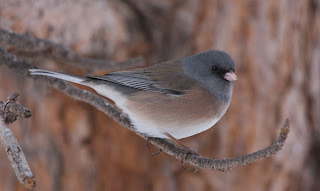 We saw 17 species total and 5 sub-species of Dark-eyed Juncos. All of our normal feeder birds were around. While we were sledding, two Common Ravens were calling as they flew by the house. Around 3:45 PM, we watched two Golden Eagles (an adult and an immature) fly over. At 4 PM, we noticed that it was actually above freezing with the temperature reaching 34˚ F.
Our First Christmas Bird Count!!! The annual Christmas Bird Count is a citizen science program devoted to counting birds in order to analyze population trends and range expansion over the years. How does it work? There are count circles, 15 miles in diameter, which are split up into smaller areas in which a party of birders counts birds all day long. After they have finished birding, they report their list to the circle's organizer, called a compiler. These circles can be found all across the western hemisphere. 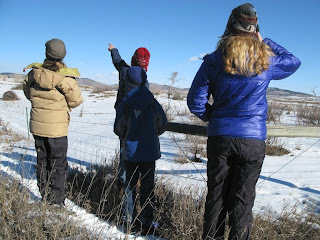 This was the 109th Christmas Bird Count and our very first time to participate! 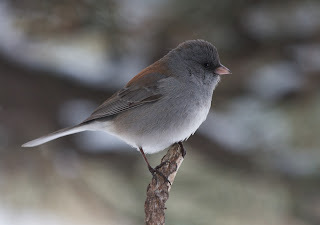 The first Christmas Bird Count (called Christmas Bird Census back then) was held on Christmas Day of 1900 and was a reaction to the Christmas match hunts where teams of hunters killed every living thing in sight (except, of course, for humans). Whichever team had killed the most individuals, won the competition. Yesterday, for most of the daylight hours, we were participating in the Boulder count circle with our neighbor Raymond Davis (we call him Davis), and his friend Sharon Dooley. We had area #1, which was basically urban north Boulder. When we left our neighborhood in the foothills, it was -1˚ Fahrenheit. It wasn't much warmer in Boulder. With no sun, a slight breeze in the face, and four inches of snow on the ground, it made for a numbingly cold day of birding. The first birds we saw in our area were some Black-billed Magpies flying over Highway 36 as we were coming into town. The creeks and lakes in our area were all frozen over, except for a couple of the larger creeks and a heated pond near a cemetery off of Kalmia Avenue. The best source of birds we found were at suburban feeders and in numerous Crabapple and Russian-olive trees. Our first stop was at a grove of Russian-olives along a creek. 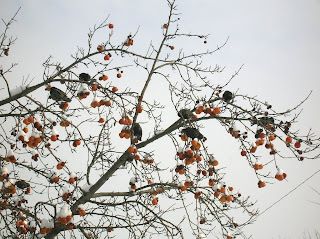 The Russian-olives were loaded with hundreds of American Robins and European Starlings. We also found four Cedar Waxwings! Next, we went to the cemetery pond which held lots of ducks and geese in the morning. 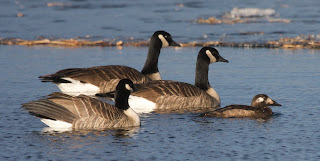 When we rechecked that pond in the evening, there were only a few Canada Geese and three Redheads. The Redheads had been absent in the morning. After that, we birded at some suburban feeders on the way to Wonderland Lake and had a pit-stop at Davis' work place. Wonderland Lake was frozen over, except for a small stretch of open water near the shore. 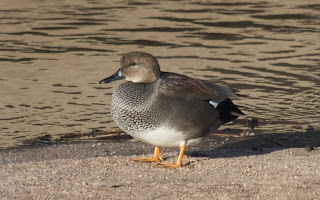 We saw five Mallards, an unidentified sparrow, and an American Kestrel. After checking that, we cruised the nearby neighborhoods looking for feeders and Crabapple Trees. We searched the western boundary of our area looking for mountain species and found five Steller's Jays. We also found a Sharp-shinned Hawk and a Townsend's Solitaire. Other good birds we found today were 50 Cedar Waxwings gathered in a couple of trees feeding on adjacent Crabapple Trees, as well as, a female Cooper's Hawk near a bird feeder in the middle of town waiting for an easy meal. It was a bitterly cold, yet fun day. Thanks Davis! 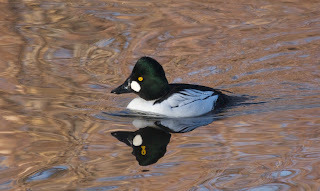 This morning we birded Golden Ponds in Longmont. The first pond by the parking lot was frozen except for a hole of open water. 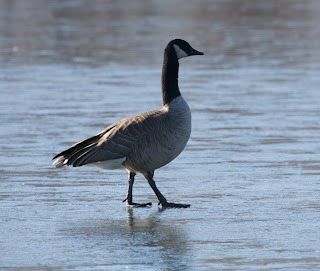 There were lots of Canada Geese, Mallards, and Ring-billed Gulls around the patch of open water. 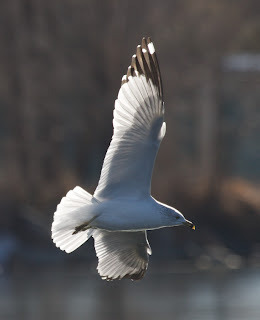 We took some good photos of the Canada Geese, and we also caught a couple of gulls in flight! At the second pond there was more open water and more birds. There was even a Great Blue Heron on the shore of an island! 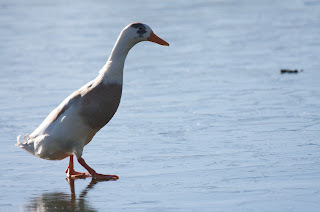 When we returned to the first lake, we found a bird that wasn't there before, a domestic duck.